A new report from Ipsos MORI shows that public trust in civil servants to tell the truth has once again moved upwards. In fact, it is now at record levels, up 4 percentage points over the last year, 15 percentage points higher than in 2009 and over double the level of trust seen when polling began in 1983. This impressive increase is a tribute to your hard work over the last few years, especially those of you on the front line, at the borders, in the call centres and on major infrastructure projects. This is good news. Gaining trust isn’t easy; it has to be earned, and can go down as well as up. Living our core values of integrity, honesty, impartiality and objectivity has always been essential for us to build trust in the Civil Service. But trust is about more than this. To be trusted I believe we must demonstrate to the public who pay our salaries that we are open and accountable, that we are effective and efficient, and that we deliver excellent public services to citizens across the UK. And, although we don’t know exactly what has driven increased trust in recent years, each of these has certainly played its part. Our commitment to openness means that the UK, as assessed by comparative international studies, is now perceived as having one of the most open governments in the world. We are publishing more data and engaging in more open policy-making than ever before. Indeed, even this blog, which would have been unthinkable only a few years ago, is an example of our increased transparency, providing the leadership of the Civil Service a platform to share their priorities with both civil servants and the public. During the last Parliament the Civil Service did more for less, by 2015 securing over £20 billion of efficiency savings a year for taxpayers. And instead of services suffering, they improved, became more responsive, and delivered better outcomes. Crime has fallen; the time taken to decide whether a child should be taken into care has halved; we delivered the hugely successful 2012 Olympics; and we helped end the Ebola outbreak, to take just a few examples. We have also become more innovative. Digital has been at the forefront of this, allowing us to provide services that are more efficient, but also shaped around the needs of users. The New Zealand Government has used GOV.UK source code for their own online presence and the Obama Administration has created a US digital service borrowing from our own Government Digital Service (GDS). And this is not the only area where we are leading the way. The UK is now a global leader in the application of behavioural insights to increase the impact of policy, and we now have more Social Impact Bonds than the rest of the world put together. These successes are a result of your hard work – across the country and in agencies and departments. The increase in public trust is a reflection of the way you have thrown yourself into the challenges we have faced, producing results that some people said weren’t even possible. Encouragingly levels of trust amongst every generation have increased, especially amongst younger generations - with those in Generation Y (born between 1980 and 2000) having the highest levels of trust in civil servants (65%). And I am confident that as we modernise the civil service and continue to deliver the high quality services that the public rightly expect, this trend can extend far into the future. 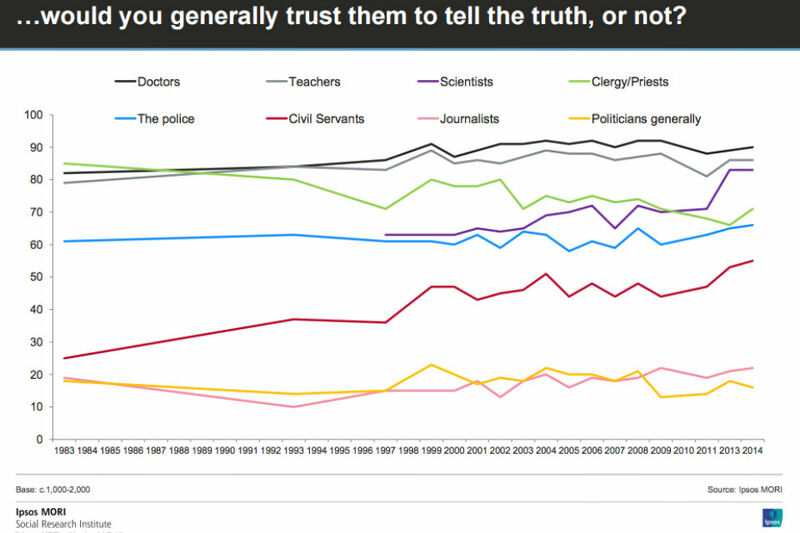 So a third of people don't trust Civil Servants. That isn't something to celebrate. As you pointed out we are doing more with less, much less in a lot of cases. Something more than a simple thank you would be appreciated, as thank you's don't pay the mortgage. I look forward to the publication of the detailed deliberations around HMRC Regional Locations, showing the option analysis and criteria weighting that was carried out. How badly did we lose peoples trust in the past for it to be so low to start with? I don't really trust what i'm told by Civil Servants 2 levels above me, let alone further up. And I work here! Sorry, but am I missing something here? The link takes you to a report published in January 2015 concerning a survey that was conducted between 5 and 19 December 2014. Why in February 2016 is tihs now being published as a good news story? To be trusted I believe we must demonstrate to the public who pay our salaries that we are open and accountable, that we are effective and efficient. "integrity, honesty, impartiality and objectivity". Great statements but when we have MP's who are anything but is it any wonder people dont trust us. "we delivered the hugely successful 2012 Olympics" ... but needed to bring the army in as the private provider G4S were unable to manage the work they were contracted to do. Looks like only around 15% of people trust politicians to tell the truth. Don't hear that mentioned anywhere. Given that they are people who drive our policies it would be pretty important to trust what they say right? I'm amused to see Behavioural Insights in the "Being More Open" section. Considering the distinctly opaque backroom deal over the privatisation of the Behavioural Insights Team (aka the Nudge Unit), you might want to move it to a separate area. There was an interesting article in The Telegraph last week about Senior Civil Servants accepting a wide variety of freebies, gifts and hospitality. This doesn't set a good example to the public. Why aren't the Department's press office all over this story to deny them to try some damage limitation?